I was going to have the drive home at twilight again like the Grandparents visit, but it seems to me that they wouldn't stay at a dinner party quite as long as they would a family gathering. Shes talking about the orphanage right? I’m hoping Todd will stop the car for this conversation, because it would probably be best if he gave Selkie his full attention on this issue. Yipes… Given he was abused, he was probably seized. Not a fun place to revisit—especially with your own kid. How much do you tell them without burdening them or triggering yourself? I think about this a lot as my own child just has one set of grandparents and will probably be asking me why when she gets older. Are you sure he was abused? He could have been in (lots of) fights with other kids. I don’t think Dave’s ever directly told us what happened, but I thought that the scene in the beginning when he thinks about adopting Selkie pretty heavily implies that he was abused. I could be misremembering it, though. The impression I got was just that he was the tough kid who was always getting into fights, not that he had been pulled from an abusive relationship. Yes, but was it ever established he came from an ophanage? If he was abused and his parents were arrested, he could have been adopted after being fostered for a period. Happened to my cousin. Those laws vary by state, too. HA!!! Let’s hear his clever response to that! OK, I was confused because I thought just mean in a boyfriend way dumped and all I could think was “Well that was an odd transition.” But no, it’s adoption “dumped.” … Yeah, this is going to be tough conversation. Wow. I wasn’t expecting this new plot element to sneak in while there are already so many loose ends. Btw, after the misunderstanding about Selkie’s dietary needs, I was a little worried that they were going to redo the entire menu, and it would end up that there wouldn’t be anything Todd could eat. Thanks for not taking the sitcom route. It’d be so much easier if he just converted to a diet that made it easier on the both of them. It seems like such a hassle to cook two entirely different meals for everything. It’s his choice to do so; he may have ethical and moral considerations. Not only that, many vegetarians who go long periods without meat will be very sick if they have some. Actually, it’s not a big deal. It’s not different than making say a side dish. Especially since selkie doesn’t eat ANY veggies, her meat is not going to be prepared any fancy or complicated way. Wondering about current “strip-time”. She started school a couple of weeks ago, at least. So, depending on when school starts where they’re at, this should be early to mid September. They’re in the north-midwest. Here, where I live, in Florida, at 7PM it’s dark. As in “sundown was an hour ago”. I realize that, the farther north you go, the longer the days are, in the cool months. But what time does the sun go down, where they’re at, that they could eat supper (and it was delayed, because they had to thaw and cook the steaks) and the sun still be up? 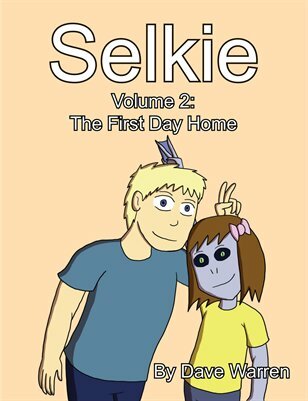 Also, with the warnings, at the pick-up at the orphanage, about “health issues during cold weather” and “space heater in her room before September” https://selkiecomic.com/?p=198, I’m surprised she’s not wearing long sleeves or a sweater. Strip-time has been moving very very slowly. The last three arcs have taken place within the same week, and it is currently late August. I plan to move time up a bit faster after this arc finishes, but yes as you’ve noted it will get to the colder months before long. I live about 62 degrees north (for reference, Arctic Circle is about 66.5 degrees north, while Chicago, Illinois is nearly 42 degrees north), and here the day-night difference between the seasons is really noticeable. During mid-winter, the sun doesn’t rise more than the width of your palm, if you hold your hand out horizontally at arm’s length, and even then on a sunny day it’s maybe 3-3.5 hours of sunlight, then an hour or so of dawn and dusk gloom at each end of the day, and then night. Whereas around mid-summer, it doesn’t really get dark at all. We don’t get midnight sun, for that you need to be past Arctic Circle, but I could easily read a newspaper outside at midnight, unless it was really heavy clouds and/or raining. Perhaps they live in underwater communities located on/near thermal vents? If they are freshwater dwellers than one could assume that they are also located near some form of running water (I keep thinking waterfalls) that helps keep the deep lake oxygenated. Bear in mind I have NO training in environmental science beyond what I’ve picked up on my own. These are just my brainstorming ideas on how such might be dealt with. Given that we’ve seen several clues that Selkie came from a community in Lake Superior (no telling if that’s the origin point of her species), and that the Great Lakes area has a noted lack of volcanic activity, I have doubts about the thermal vent idea. My thoughts are that they either go into hibernation in the colder months, have a better tolerance for cold water temperatures than cold air (somehow), or simply have artificial heating. In my experience, events like this often snowball. Social groups are like that: one member gets upset just thinking about something, someone else close to them notices, shared experiences start feeding into each other… Yeah, he’d better pull over. I wasn’t exactly dumped, but there wasn’t anyone else to take care of me, so the orphanage was it. I’ve followed this strip with great interest, because I started out like Todd and Selkie. Thanks for dealing with these issues honestly and occasionally humorously. I was eventually reunited with my birth family, so I’m eagerly watching Selkie’s memories. I know I’ll get backlash for this, but. That …pony show… has infected enough fandoms and communities. And most little girls I watch at the daycare where I work never even registered it on their radar. It was the grown people, especially men, who should have better taste that are making it extend, are buying the merchandise intended for little girls and are ruining everything. I’m not exaggerating. The refusal to say “everyone” and “everybody” makes no sense! If you are a sentient being with a body then you can say everyBODY. If there is a group of selves or ones you may say everyONE. Ponification has inspired merification in the mermaid world. I can’t even tell people that I enjoy a certain British sci-fi/fantasy show anymore because they start asking who I support as Doctor Whooves’ companion, Twilight or Derpy. No. No no no no. Please keep that ….series… out of the Selkieverse. Plus I don’t want to find a big company took exception and filed suit because of it. As someone who likes the series… I actually agree with CraftyJester. Enough people dislike it (for whatever reason) that adding it at this point would probably be a bit of a nasty move… besides, there’re many places to get our MLP fix, but few for Sue & Catherine. I can appreciate your feelings on the whole affecting fandom’s and possibly even on the over saturation of the show as a whole. But what I can stand is your comment about grown men having better taste? Yes it’s more popular with adults. The fact that a show that is devoid of blood and testosterone flued violence has become popular with men is a *good* thing. Better taste? What kind of taste should they have? Seriously? That is the most pathetic and condescending attitude to have. Yes I don’t want it infecting everything. Yes that bloody frustration when it dose happen. But that applies to everything, ‘Cake is a lie’ anyone? Honestly, though, it’s just a clever, lighthearted(for the most part, charactors having psychotic breaks and body-snatcher invasions not withstanding), and engaging show. Most of the fun honestly comes from being part of the community rather than from watching the show itself. I will agree with you that “everypony” doesn’t make any sense. It doesn’t even make sense in context as there are several sapient, non-pony, species(Dragons, griffons, donkeys, cows, etc). It’s just a quirk of the show. Spotted this comic on TWC and popped over to check it out… and Selkie melted my heart. Thanks. The archives was just what I needed after a long week. I vote for all my favourite webcomics once a week, Selkie gets its vote too, although it’s another comic through which I pop over to TWC. I’m looking forward to this arch (hopefully) revealing a little more about Tod and maybe Selkie’s past. I recently found a group protesting your comic in my college. I found that incredibly strange, mostly because I had no idea other people in my city actively read your comic. The bigger reason why it’s so odd though, is I come from a city that is extremely liberal so I would think they would embrace your comic since it has pretty much everything they tend to love in it. That’s… what? Do you remember what they were protesting about it? Was there some issue they took with a storyline or theme? This news makes me very very curious… I can’t believe there’s an anti-Selkie activist group. O_o If you find an article or anything, I’d love it if you could email me a link. Who makes no enemies, makes nothing. Don’t take them or their claims too seriously, Dave- “you can’t please all the people all the time” is only a cliche because it’s true. Anyway, perhaps they’re not anti-Selkie,but anti-Selkies? Their president may have had a bad experience on the Scottish sea-shore. Or lost a job interview to one. You know, the usual selfish reasons. Oh it’s not a huge group. It’s like 9 people who get together in a classroom once a week to discuss things they protest. I happened to be walking by one day and heard them bring up your comic. I listened in for a bit and it seemed like they were upset over they way you wrote certain characters. Keisha, Todd’s gay brother and Selkie in general. Apparently they’re not ‘correct’ or something. Oh I wasn’t bothered by the idea, more curious than anything.